Sunday was the report date for Mets pitchers and catchers, and on Monday the team officially kicked off Spring Training in Port St. Lucie. Even though the storylines from now until the end of March tend to be BS fluff, I still love to hear all of it. I’ll take the BS fluff stories over the Cold Stove any day. Baseball is better than no baseball. Thor To Bring Heat: Noah Syndergaard showed up on Sunday and addressed the media. He basically told everyone he’s put on 17 pounds of muscle and plans to throw 110 MPH. I love the fire, but please Jesus will somebody tell him to take it easy for a few weeks? Pray for Thor’s UCL. We need that arm intact for 200+ innings. 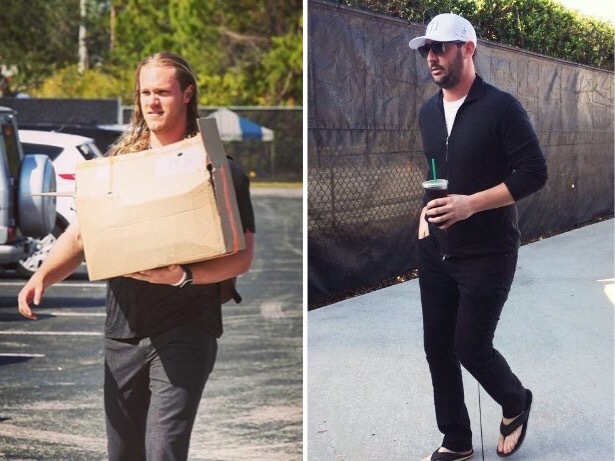 Slimming Black: Matt Harvey on the other hand showed up on Sunday looking like he lost 17 pounds in addition to a rib. But after I saw him in his press conference and during his bullpen sessions I think it was just the optical illusion of his slimming black shirt. Great to see Matt back and looking healthy. Yo Quiet: It’s been fairly quiet on the Yoenis Cespedes front (other than an incredible Cowboy photo shoot at his ranch). Unlike last year there were no stories about Yo showing up to camp in a sports car. Probably because he spent the day in the parking lot deadlifting all the other player cars. No Familia: The only pitcher missing from camp on day one was Jeurys Familia. Apparently he was having some visa issues. At first I thought maybe Trump had him deported due to his criminal record, but then he rolled into camp on Tuesday. The only takeaway I had on Familia was that he typically speaks great English, but when it came to talking about his domestic violence arrest all of a sudden he’s using interpreters and lawyers. The old no comment treatment. Classic. Vegas For Life: The Mets designated Ty Kelly for assignment to make room on the roster for one of their relievers, and he immediately cleared waivers because duh. Were people really worried about Ty getting claimed? No chance. Forget Versatility: Terry Collins said he doesn’t plan to get Michael Conforto reps at first base. He feels Michael has too much on his plate already and doesn’t want him focusing on learning a new position. Terry did add that Jay Bruce aka the human statue might take some grounders at first though. I don’t care if it’s Michael or Jay (probably should be both), but Terry better have one of these guys learning some first base. He’ll probably just wait until Duda’s back flares up and then have one of them learn the position on the fly. Sounds smart. He Hasn’t Thrown: David Wright hasn’t thrown a baseball yet. Sounds like another guaranteed 162 game season for our boy D-Wright! No doubt about it. And by that I mean he’ll be a player/coach by May. Please sign Kelly Johnson. Now that we know Wright’s true status a Johnson signing is a no brainer. 7 Man Rotation: Terry Collins indicated that Zack Wheeler, Robert Gsellman, and Seth Lugo are likely to start Spring Training as starting pitchers. I’m actually excited about a competition for the 5th starter job. Let’s just hope the competition stays limited to the 5th starter spot. We Pray: The takeaway from the first few days of camp is that all the players and the organization are excited by the fact that our young pitchers are all in camp and supposedly healthy. That was a running theme of camp last year too, and we all know how that turned out. The bottom line is pray for the healthy rotation. Light your candles and build your shrines. Ask the old gods and the new to bless the shoulders and elbows. Pray that Bartolo Colon left behind some of his durability magic so these guys can make it through a full season.